A space age plant, pioneered by NASA, will provide cooling for Aberdeen’s new £333million exhibition centre. The Event Complex Aberdeen (TECA) which is being delivered by Aberdeen City Council and its development partner, Henry Boot Developments (HBD), is being constructed by Robertson Group. It will open this summer close to Aberdeen International Airport and the new city bypass. The 12,500-capacity main arena will host conferences, exhibitions and music concerts, and is expected to attract major artists and events to the city. 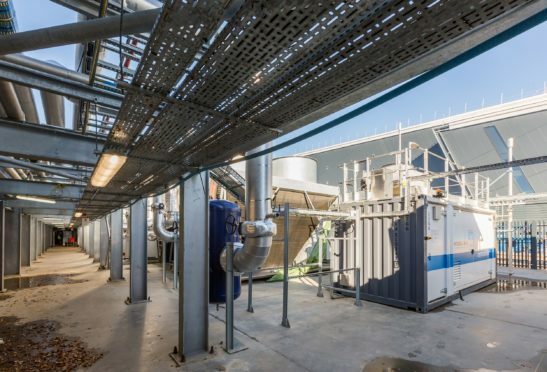 The energy centre’s combined cooling heat and power (CCHP) facility will use the largest hydrogen fuel cell installation in the UK. Council co-leader Jenny Laing said: “Aberdeen is already a world-class city for energy production and energy innovation, so it is entirely fitting that we continue this expertise with our own new world-class venue. Robertson Chief Executive Officer Derek Shewan said: “Completing construction of the energy centre marks another significant milestone in this landmark project.